Netherton's Tom Flatters (left) in action in the 2-1 win over Deeping Reserves. Whittlesey Athletic manager Andy Lodge reckons it’s perm any one from six teams to find the winner of the Peterborough Premier Division this season. 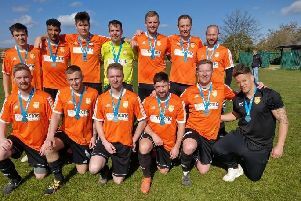 Whittlesey started as hot favourites to finish top, but Lodge reckons they have ceded that position to current leaders Moulton Harrox who have won all 10 of their top-flight games this season. But Lodge, who suffered his heaviest defeat as Whittlesey boss when they were dumped out of a Cambs Cup by Fulbourn 5-0 last weekend, believes anyone in the current top six has a chance. Whittlesey are fifth ahead of their game at home to Sawtry this Saturday, but with games in hand on most of the teams above them. “It’s shaping up to be a great title race,” Lodge said. “But you’d have to make Moulton the favourites right now as they just keep on winning. “Pinchbeck and Peterborough Sports are strong and although Netherton have dropped a few points they are still capable of winning it as are Holbeach Reserves. “I still fancy us as my players tend to turn up for the biggest games and we haven’t really played any of the top sides yet. “I can’t wait for the Sawtry game though as I expect my players to put in a strong performance after our result last weekend. “Fulbourn were decent, but the side we beat in the previous round were better. We just delivered a display that lacked the normal Whittlesey spirit. Moulton should make it 11 straight wins this Saturday as they visit struggling Riverside. Netherton, who have played four more games than Harrox, moved into second place last weekend when scoring twice in the final 20 minutes to beat Deeping Rangers Reserves 2-1 at the Grange. Substitutes Tom Randall and veteran Ronnie Fortune scored the Netherton goals - the latter with a brilliant strike. Netherton and Pinchbeck are without a game this Saturday, while Peterborough Sports Reserves (away to ICA) and Holbeach Reserves (home to Ketton) have tricky fixtures. ICA warmed up with a 10-1 win at Crowland which saw hat-tricks for Nathan Glover and Joshua Smith.